Baker Boyer Bank, providing wealth management as well as personal and business banking services. Banner Bank has played an important part in the history and growth of the communities we serve. We are an award winning HVAC, plumbing, and electrical company. CHS Inc. is a leading global agribusiness owned by farmers, ranchers and cooperative across the U.S.
College Place School District educates a diverse population of 1300+ students from K-12th grade. To protect and enhance the natural resources on public and private lands within Columbia County. Columbia REA delivers reliable electricity and is owned by the people we serve. Earth science and engineering consulting. H.T. Rea Farming is a fourth-generation family owned and operated farm in the Walla Walla Valley. Ingeniux is a software development company that digital content management software. JR Simplot is a large food & agribusiness Company striving to Bring Earth’s Resources to Life! Key Technology is a global leader in the design and manufacture of process automation systems. Corn ethanol bio-refinery located in the Port of Morrow in Boardman. Engineering, Environmental, Industrial Hygiene, Planning, and Survey services throughout OR and WA. Construction business and home-owner equipment rentals. SLC is a non-profit organization focused on resource conservation. Serving growers in WA, ID & OR with crop inputs, seed, equipment, research, technology & advice. Tri-State Steelheaders is a nonprofit organization with a mission to restore native salmon. Tyson Foods- Pasco Plant has several positions and opportunity for internal promotions. The Conservation District assists local landowners in the conservation of natural resources. Walla Walla Corps of Engineers has many different types of positions. More of an introduction. WWPD is our local, municipal police department. Walla Walla Public Schools educates a diverse population nearly 5,800 students. Wilbur-Ellis is a global services leader in precision agriculture technology and products. Wilson Orchard and Vineyard Supply – Affordable Irrigation and Structural Services. Provide an array of employment and training services to job seekers and employers in Washington. 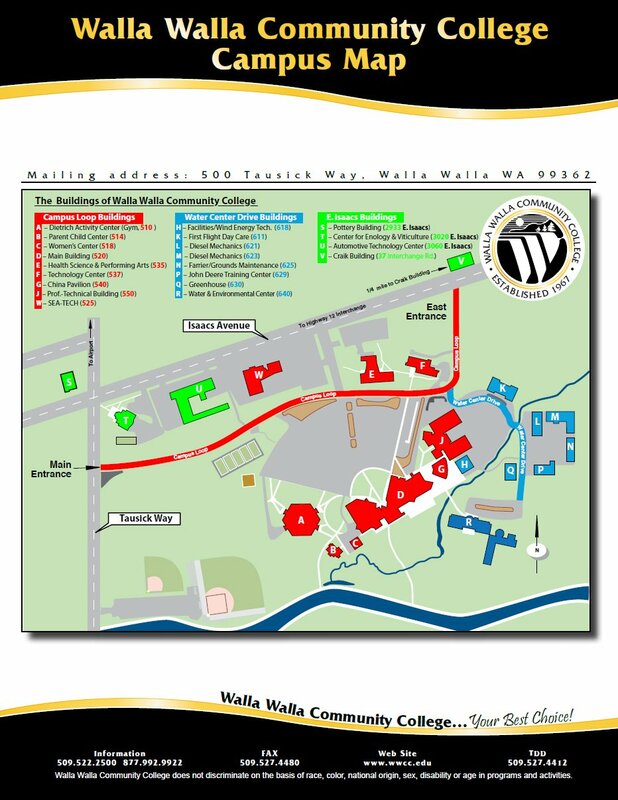 The Water & Environmental Center is Building R on the campus map. Take Campus Loop to Water Center Drive. On Water Center Drive, you will pass the Childcare Center (K), Diesel Mechanics (L), the John Deere Center (P). Building R is at the end of Water Center Drive. On campus parking is free. Signage will be posted on the day of the event.